These are some of my older photos from Northern Ontario taken from the late '60's through 1983. 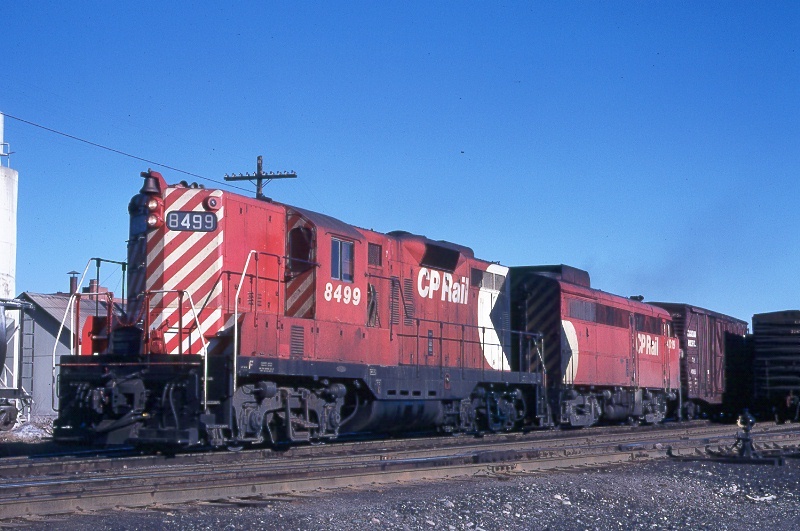 This was one of my very first CPR shots, taken on Aug. 25, 1964 at Sault Ste Marie, Ontario. A rather cloudy and gloomy day, but it was the only time I got a Budd car in the old paint. For Christmas of 1967, Joe Seidl and I went up around the north shore of Lake Superior. 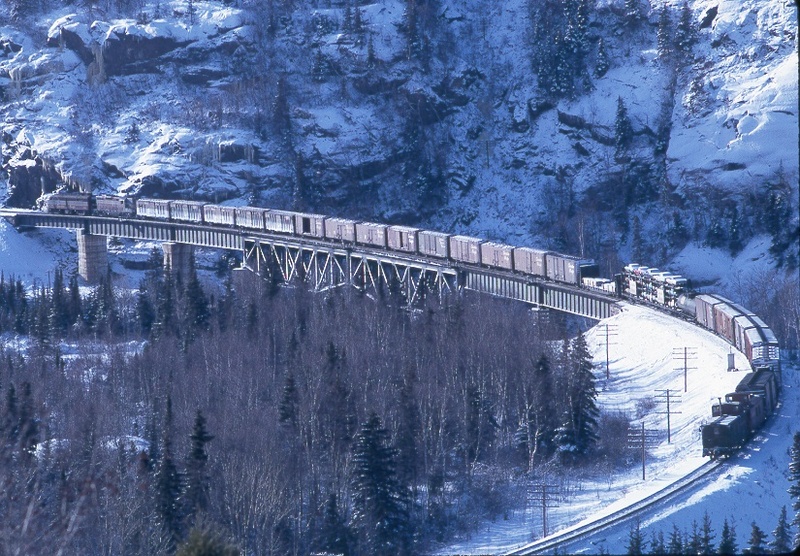 Here is a freight train at the Little Pic River Bridge on Dec. 27, 1967. 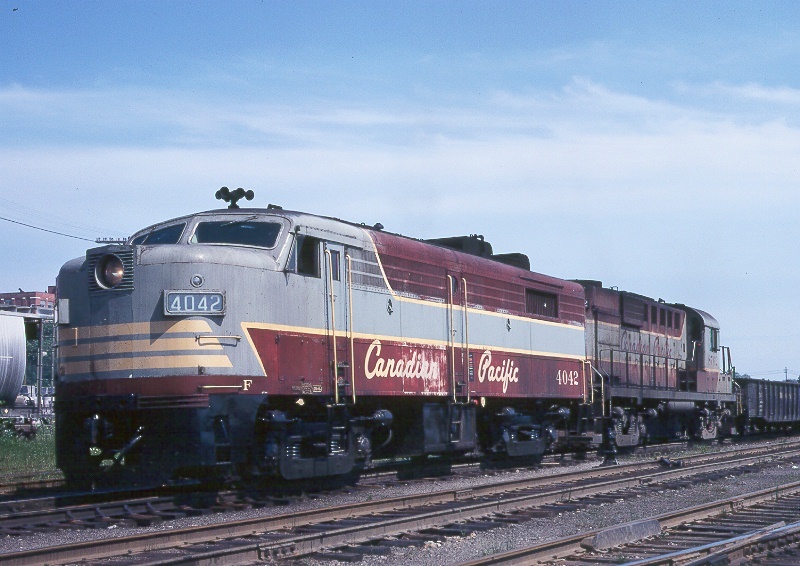 The "Canadian" on Dec. 27, 1967, westbound a few miles east of Schreiber, Ontario. 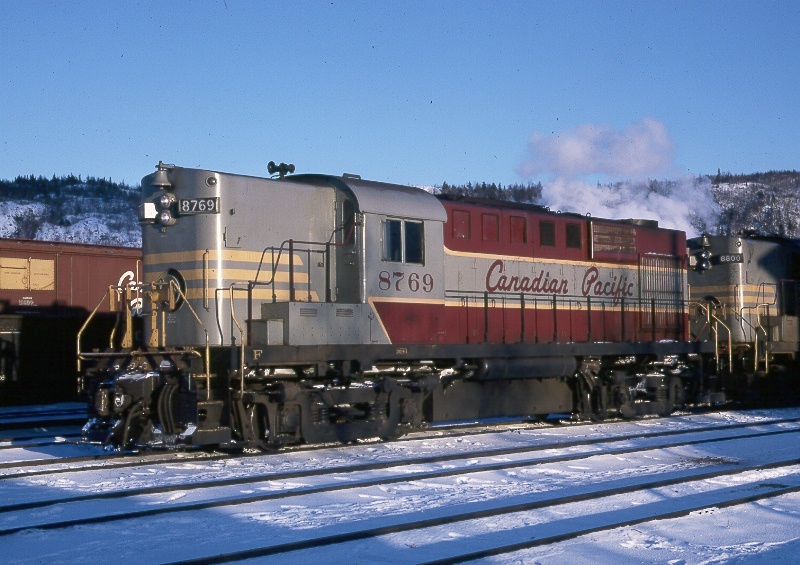 Here is one of the units from the "Canadian" on Dec. 27, 1967. Schreiber, Ontario. 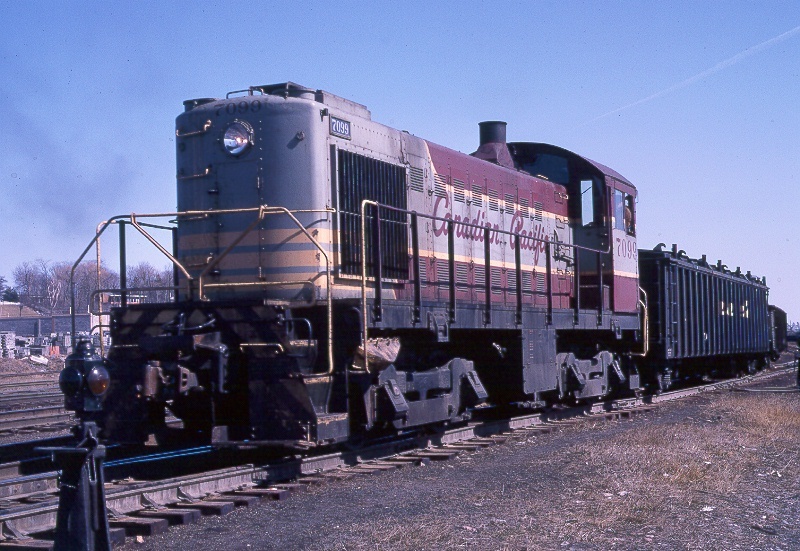 And here is a RS18 in the late evening on Dec. 28, 1967 at Schreiber. 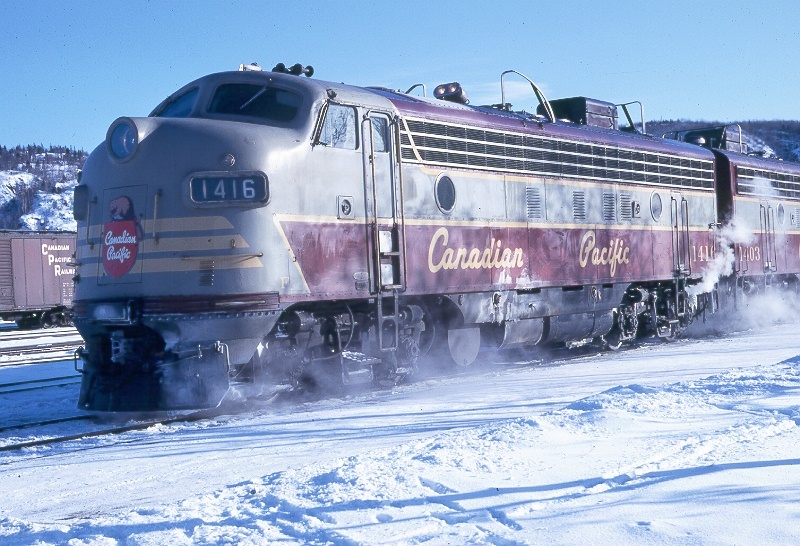 This is the Canadian westbound at Marathon, Ontario on Dec. 29, 1967. The operator has just hooped up the orders as the train pulls out in a raging blizzard. This is Windsor, Ontario on Sept. 20, 1969. Somewhere east of Thunder Bay, Ont. in October of 1970...maybe Schreiber? In Dec of 1971 I moved to Sault Ste Marie, Ontario and started work for the K-Mart store there, and of course was able to get a lot more CPR shots. 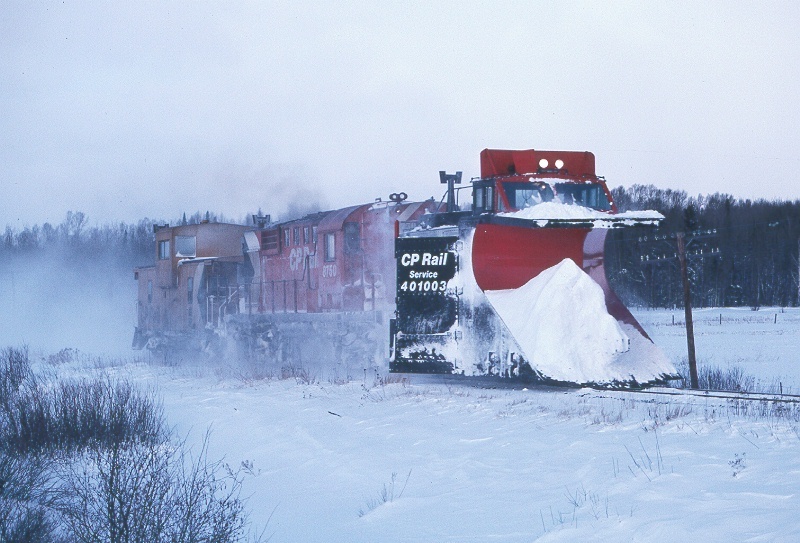 Here is a plow extra on Feb. 6, 1972 headed east from Sault Ste Marie. 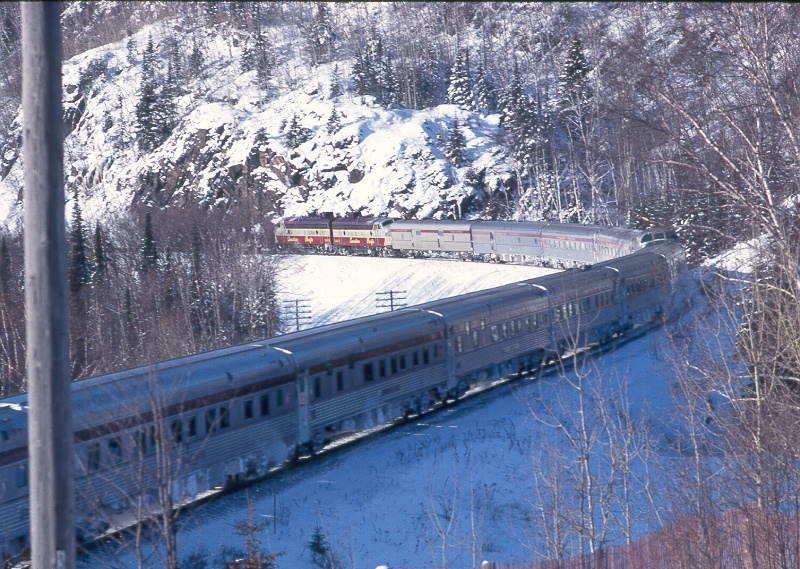 Here is a transfer run to the Algoma Central with empty cars for steel loading. 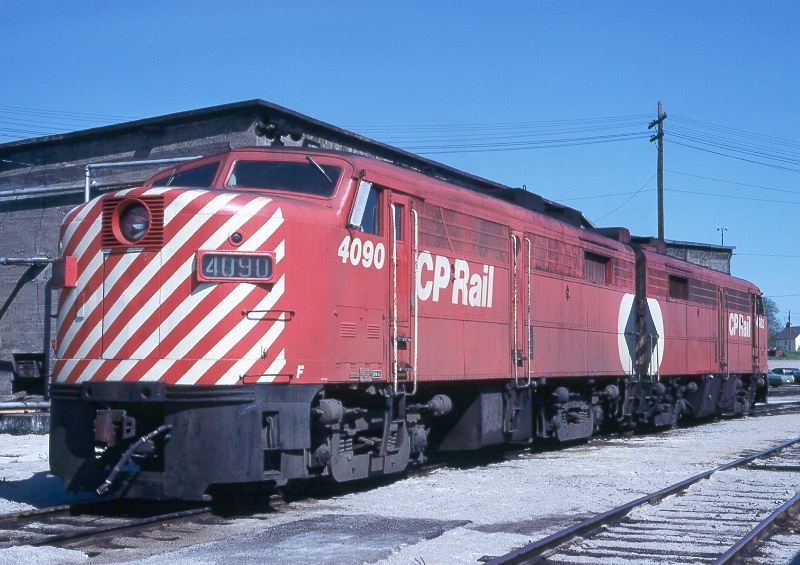 Shown here at the CPR's yard in the Sault on April 25, 1972. 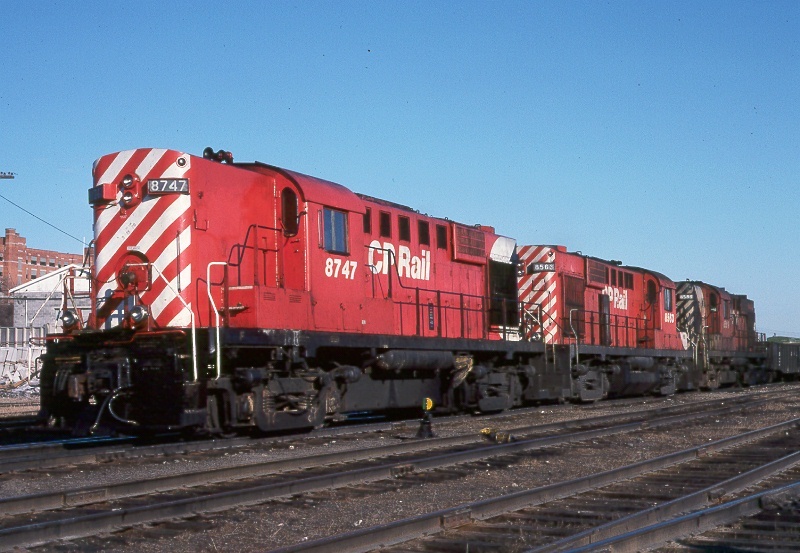 This is the power from Train 911 which has just arrived at the Soo on Oct. 7, 1972. 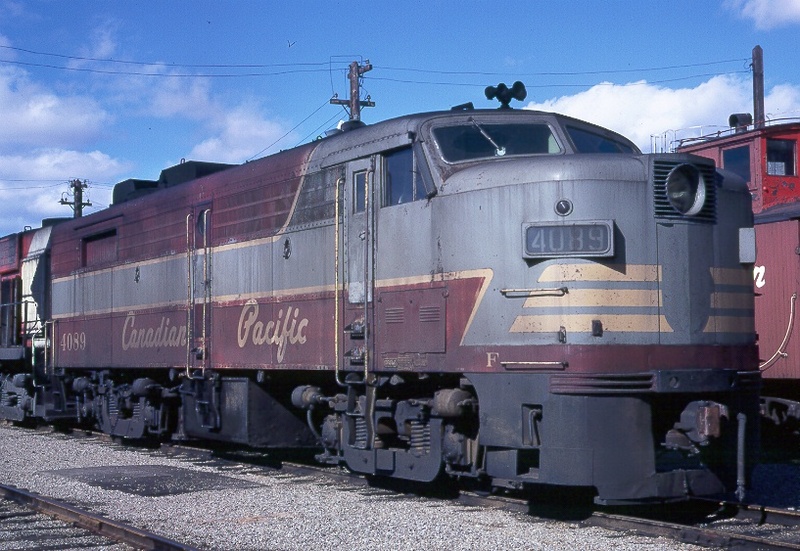 Train 911 usually had Alco power, including this cab unit. 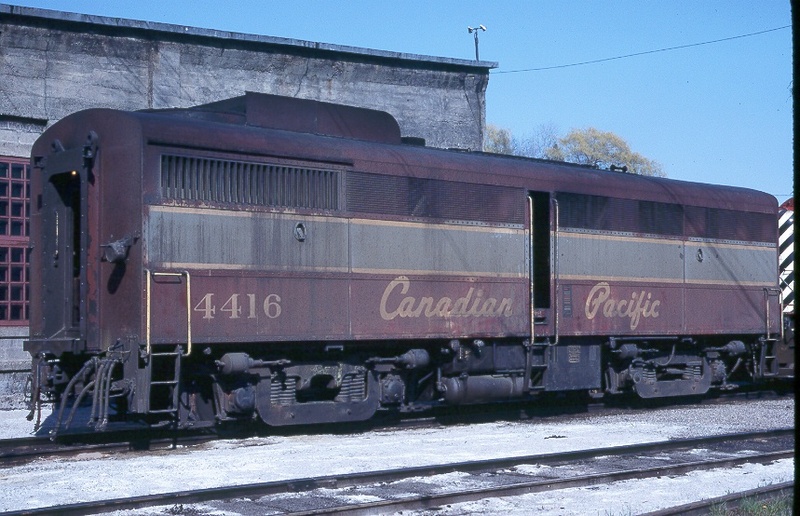 Shown at the Soo on Nov. 13, 1972. This unit looks like it has just been repaired and the paint crews haven't yet gotten to touching it up. Sault Ste. Marie, Ont. on Nov. 13, 1972. 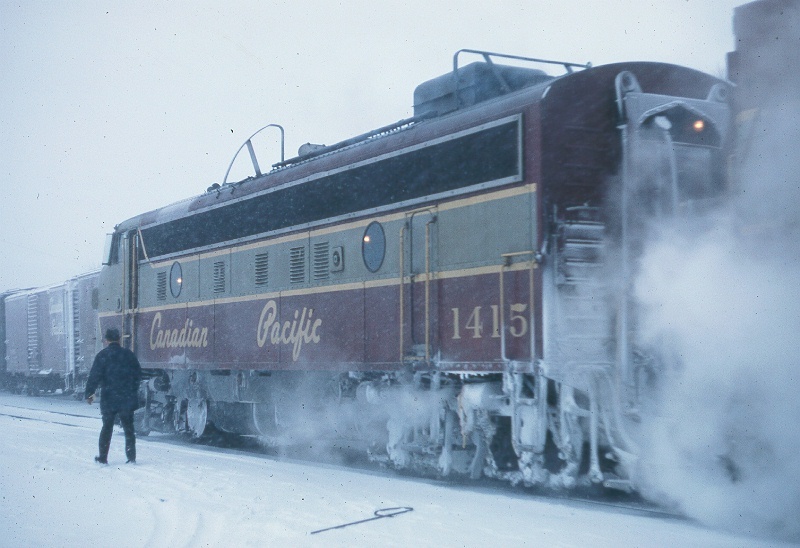 1973 was a good year for me taking CPR photos at the Soo. 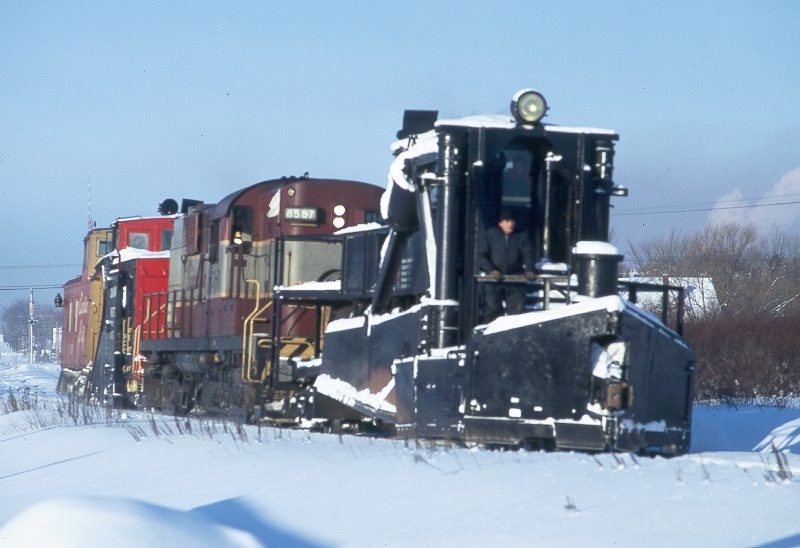 Here is the power from Train 911 heading for the barn after turning on the wye on March 18, 1973. There were a fair number of leased engines, including this B&O F unit, and also a B&LE F unit was on another 911. 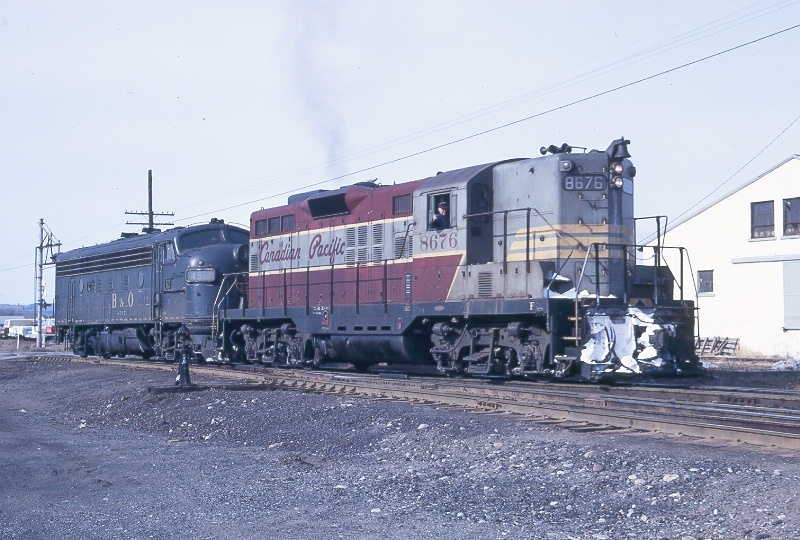 Again this is 911's power just arriving at the Soo the next day, March 19, 1973. Even though there weren't any foreign units today, the GP and FA unit were a good catch. 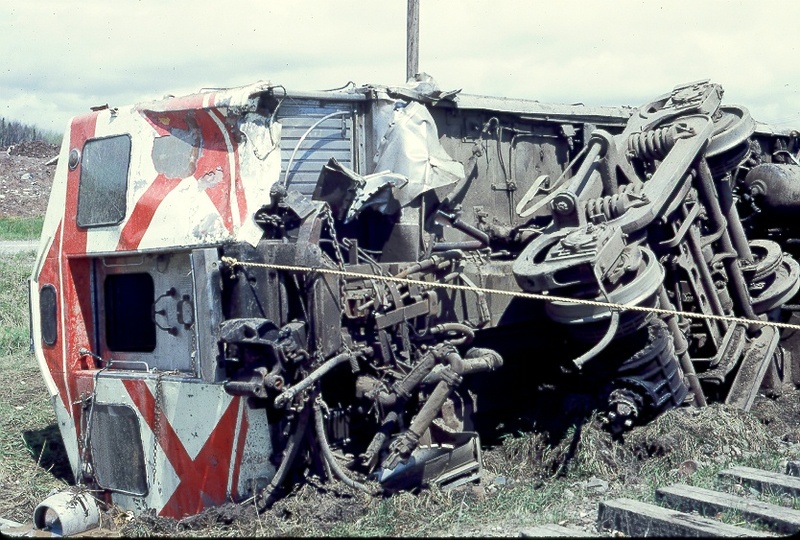 On May 10, 1973 the Budd car from Sudbury to the Soo hit a dump truck at a crossing in the Soo. The Budd car was knocked sideways into the ditch. You can see the universal drive joint on the truck, which was turned 180 degrees by the impact. 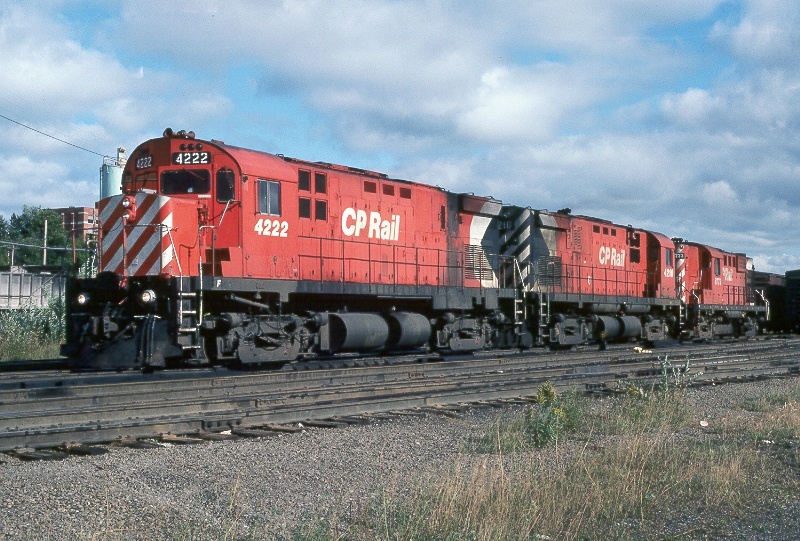 More older Alco power was showing up in the Soo, here is a B unit on May 20, 1973. 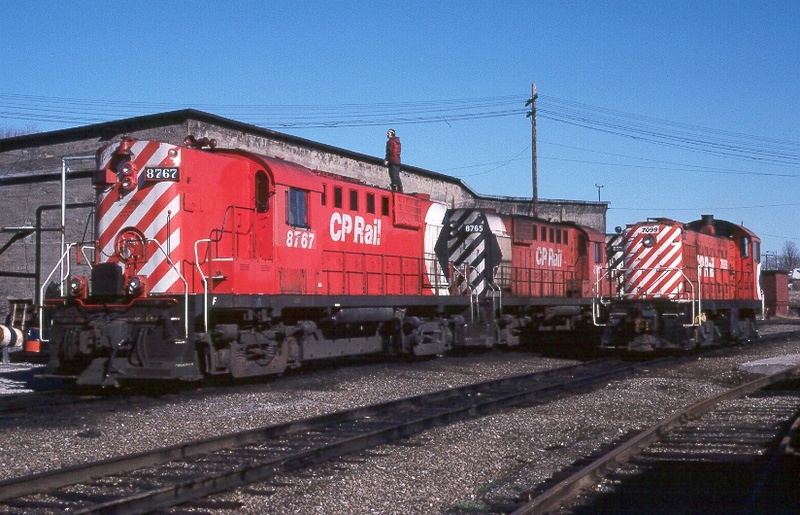 A nice clean set of "PacMan" FA units are basking in the early spring sunshine at the Soo on May 30, 1973. A late snowstorm has left some white fungus on the ground! 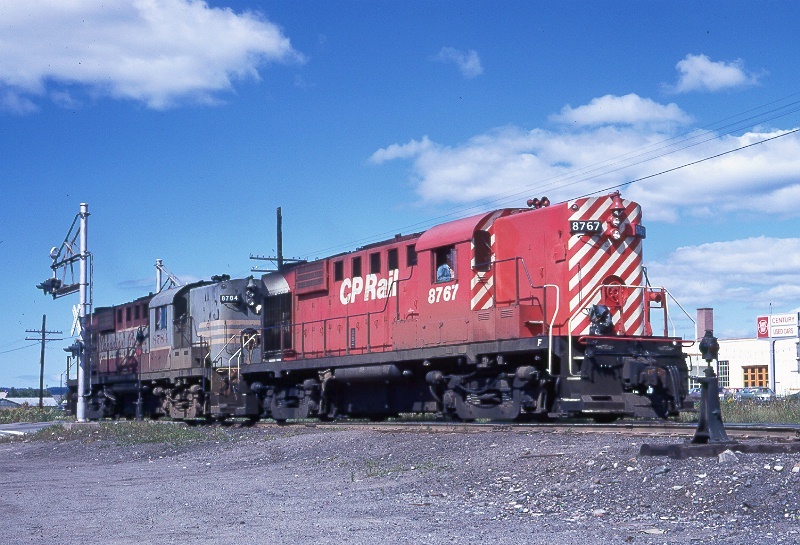 On June 23, 1973 911 had this older power at the Soo. 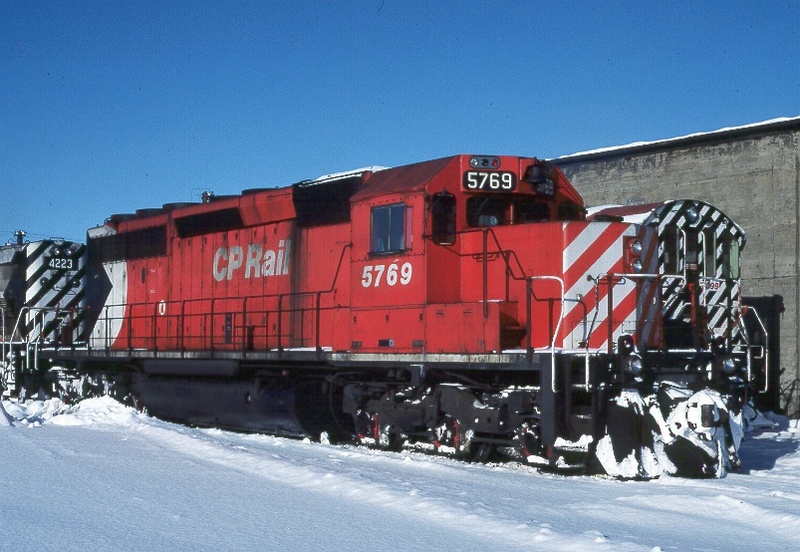 Here is the 8171 yard engine "in the bush" after running over a derail at the Algoma Central transfer yard. This happened when a green brakeman threw the derail on instead of off as the CPR transfer was heading out of the ACR yard. The ACR sent 2 GP units over to help pull the 8171 back onto level ground...note the cable between the 2 units. Aug. 5, 1973. Just a few months later this engine was again off the track account running over a derail! 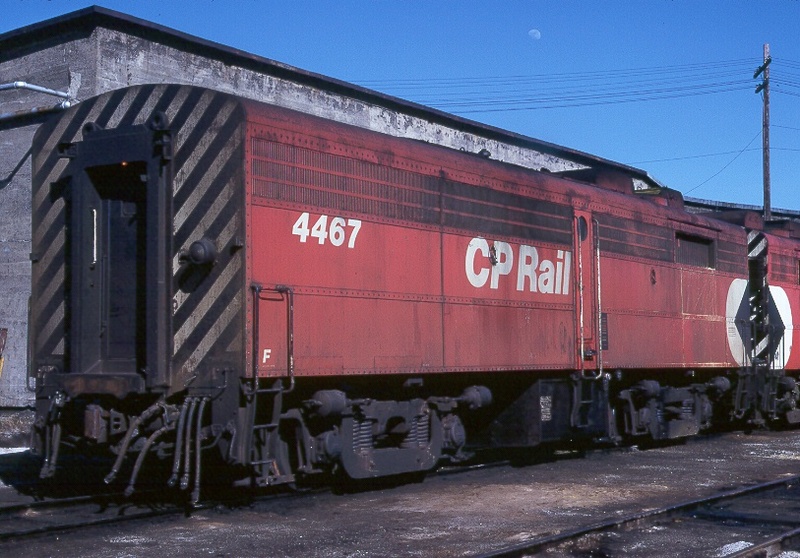 Here it is shown at the Soo yard in November of 1973. 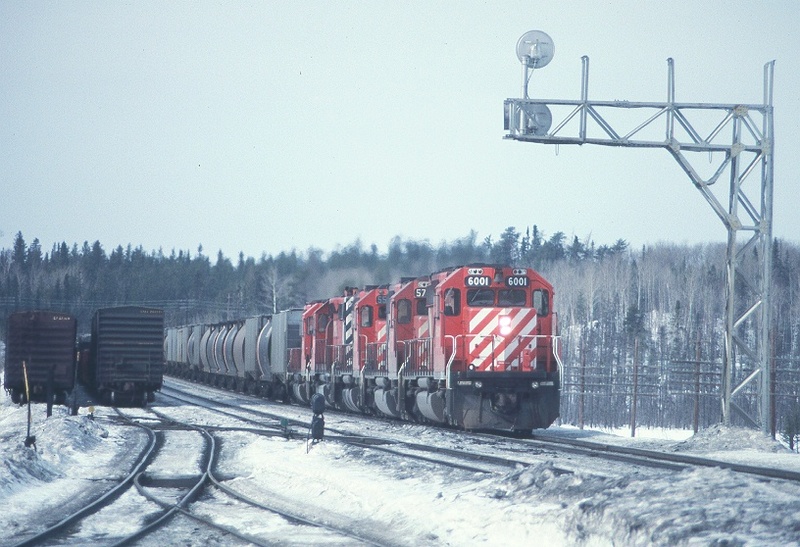 Here is an extra east just east of Sault Ste Marie on Feb. 25, 1974...certainly a scene not to be found anywhere today, what with an F unit and 40 foot boxcars! 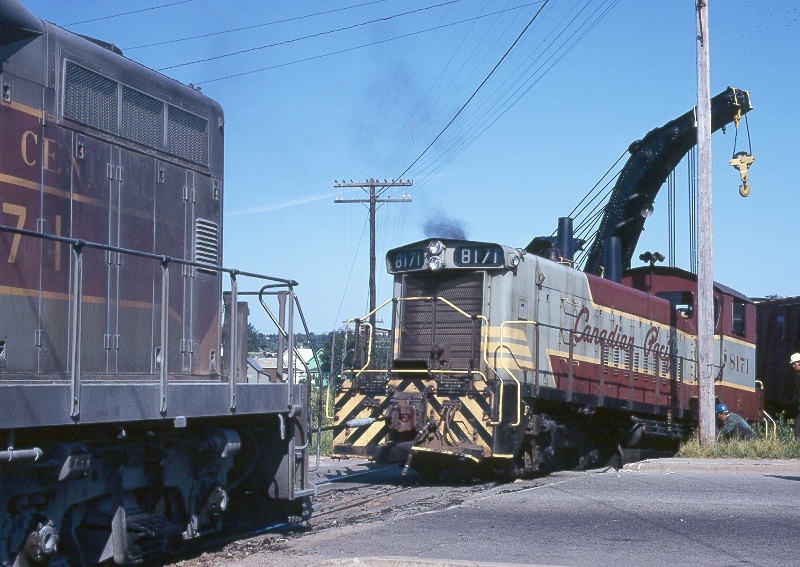 On May 1, 1974 Train 911 had these 2 Alco cab units, and this is a good roster of an FB unit - note the moon high in the sky in this late afternoon photo taken at the Soo. 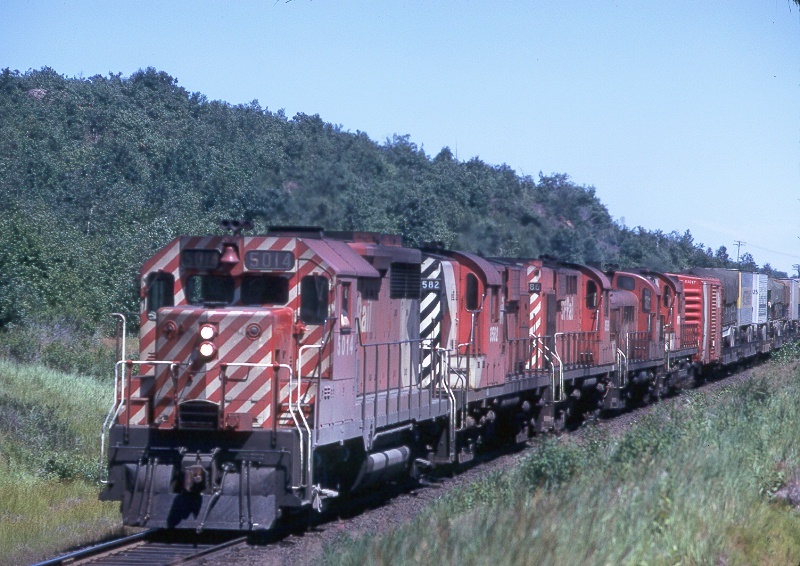 Here is Train 911 westbound near Sudbury, Ontario on July 27, 1974. Sure is an interesting consist! 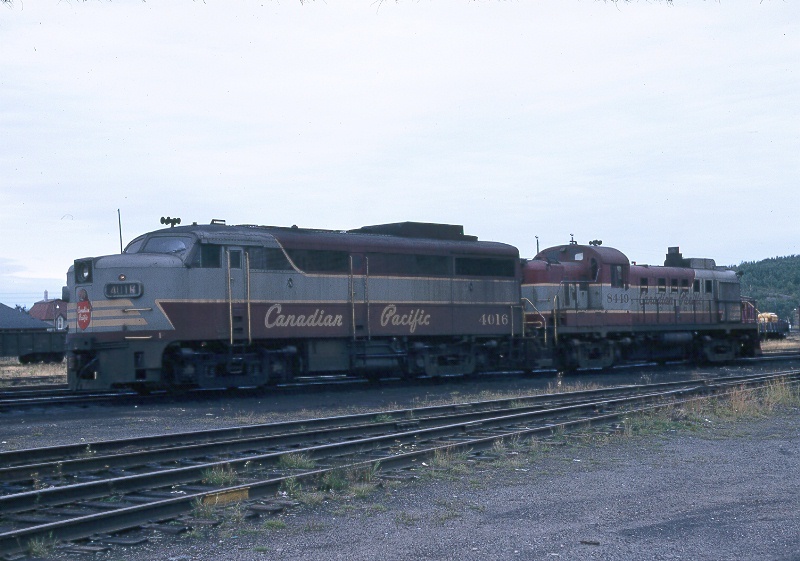 This is a group shot of the loco's in Sault Ste Marie on Aug. 11, 1974. 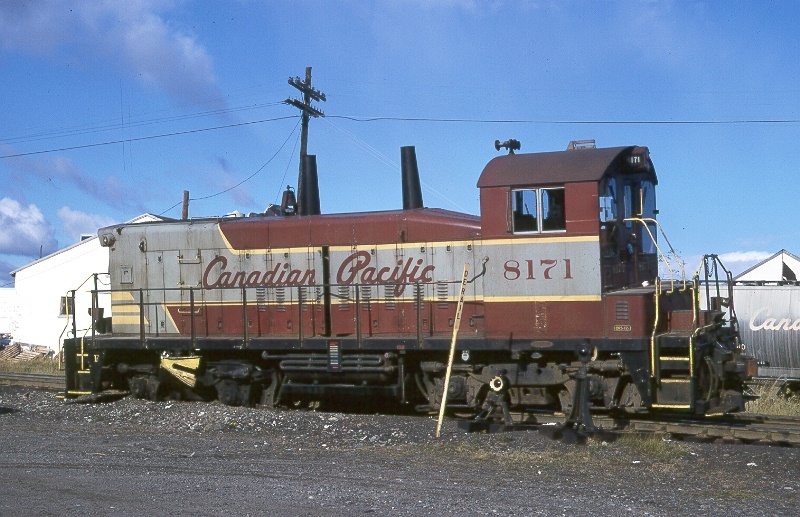 The yard engine, 8171, has just been repainted into the then new "PacMan" scheme, and the F unit is part of 911's power. 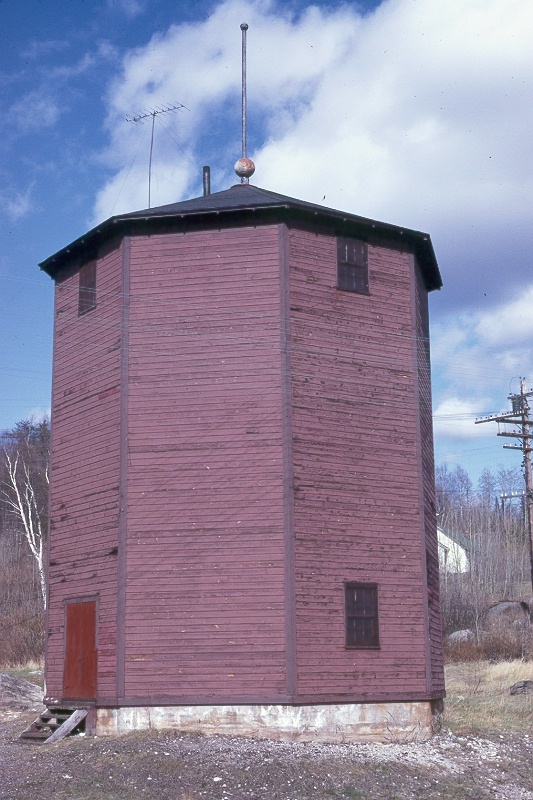 This is the water tank at Franz, Ontario on May 21, 1976. 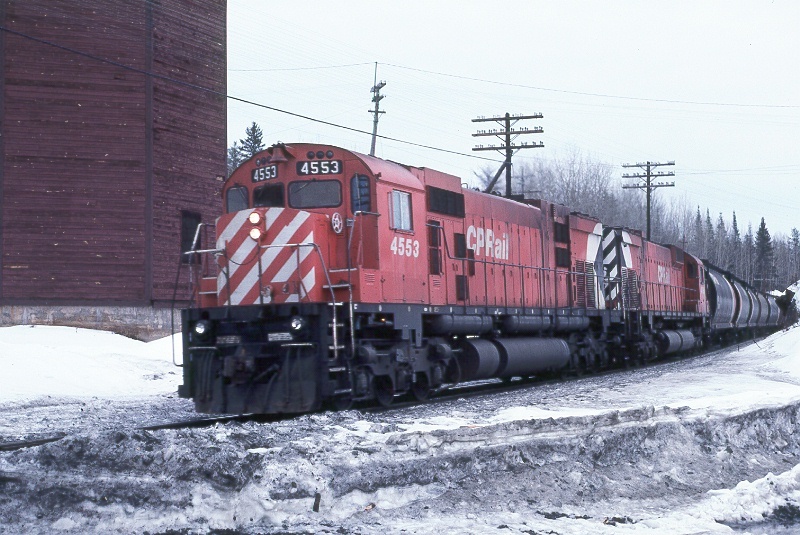 Franz is the point where the CPR crosses the Algoma Central. This tank has long since been torn down. Note the TV antenna on top of the tank...once this building was torn down, TV reception in Franz was almost worthless! Reggie (the Franz operator) was not too pleased about this. 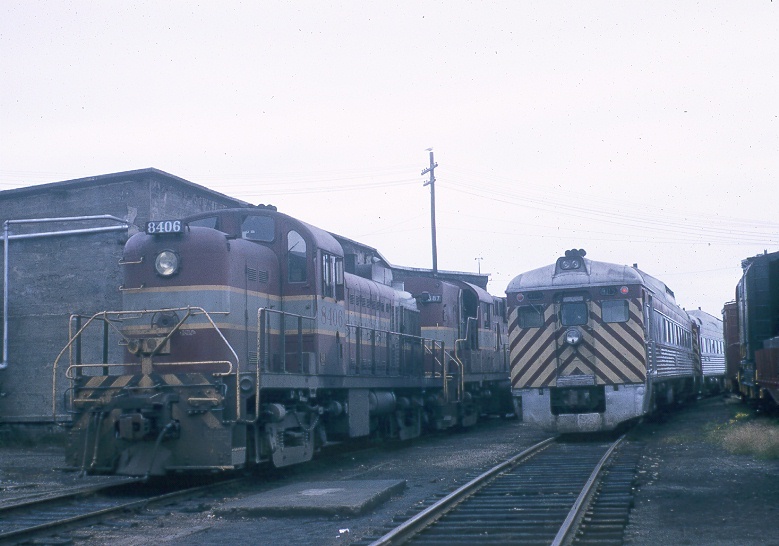 Train 911's power at the Soo on April 16, 1979. This was the last time I ever saw the maroon & gray scheme on a CPR unit. 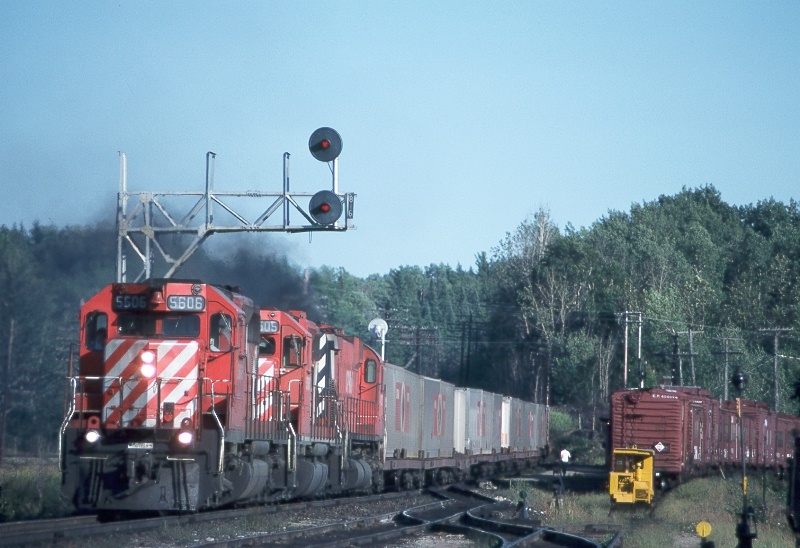 This is 911's power at the Soo on Oct. 5, 1980. I was working the 2nd shift as the ACR operator, and one of the CPR employees called me at the ACR saying that I had better get my camera and take pictures of 911's engines! 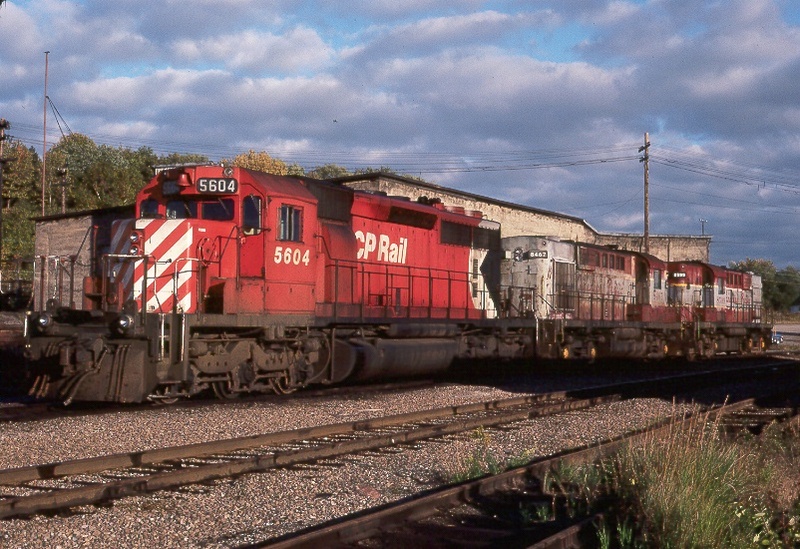 I'm sure glad that he did call me, and that the ACR yardmaster let me take off to get this photo. 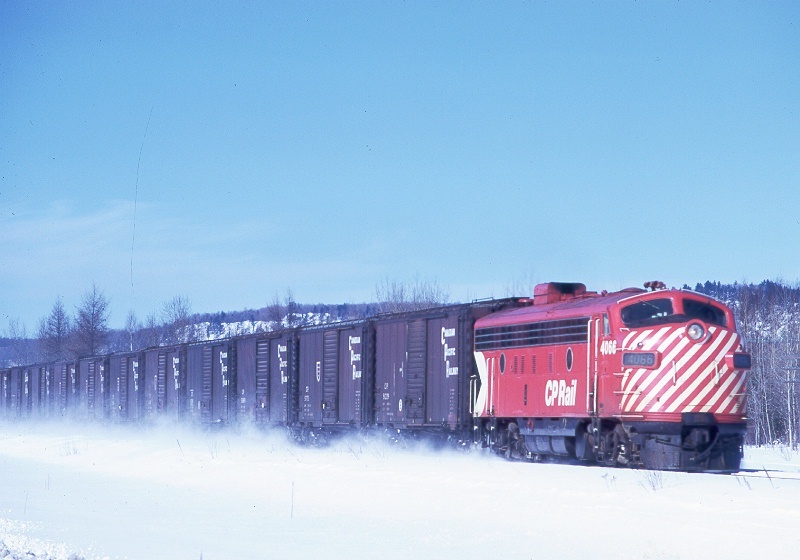 A bright cold day after Christmas 1980 at the Soo. 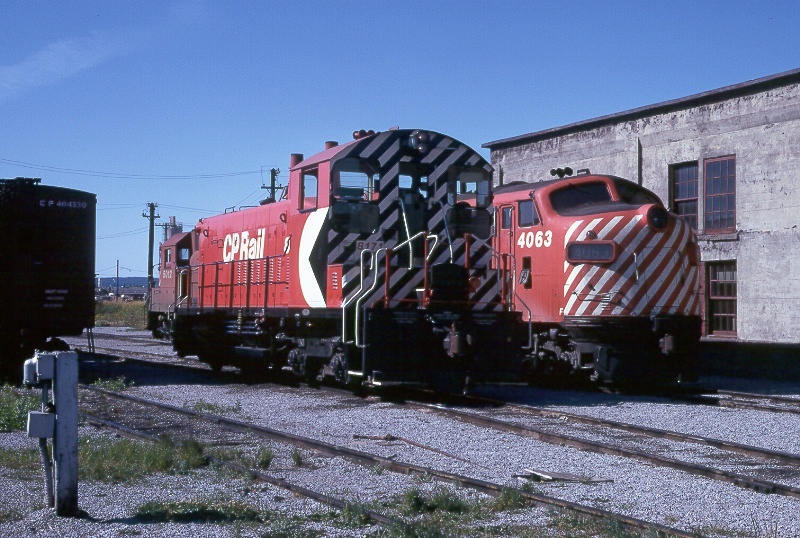 An assortment of locomotives at Sault Ste Marie on April 20, 1981. 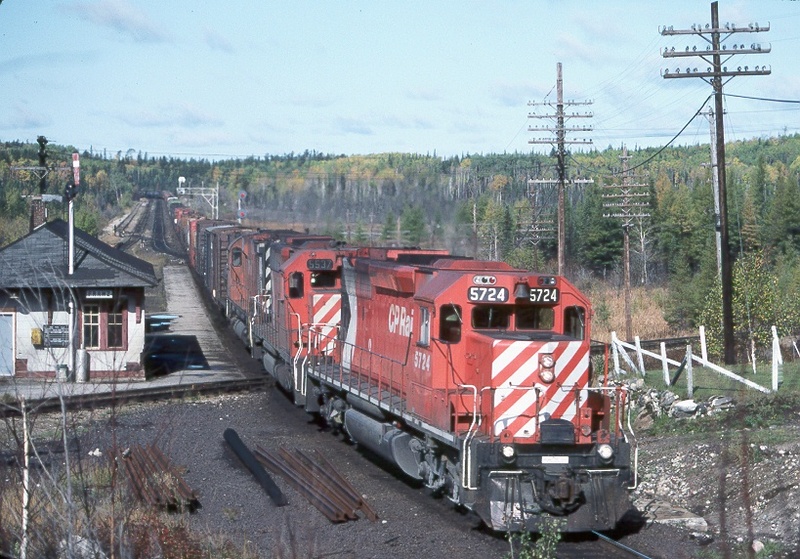 Again here is Train 911 just arriving at the Soo with a C424 on the point on Sept. 20, 1981. 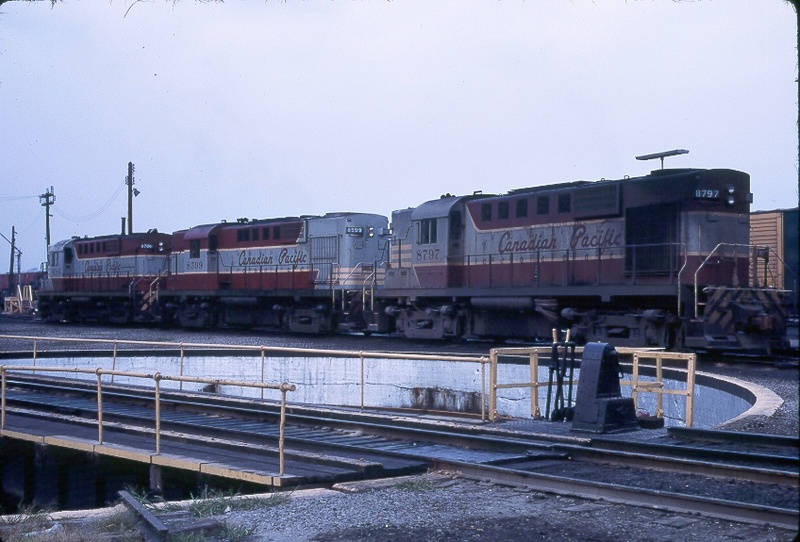 Here are the 2 CPR S4 yard engines ready to take a drag over to Soo, Michigan on Sept. 20, 1981. 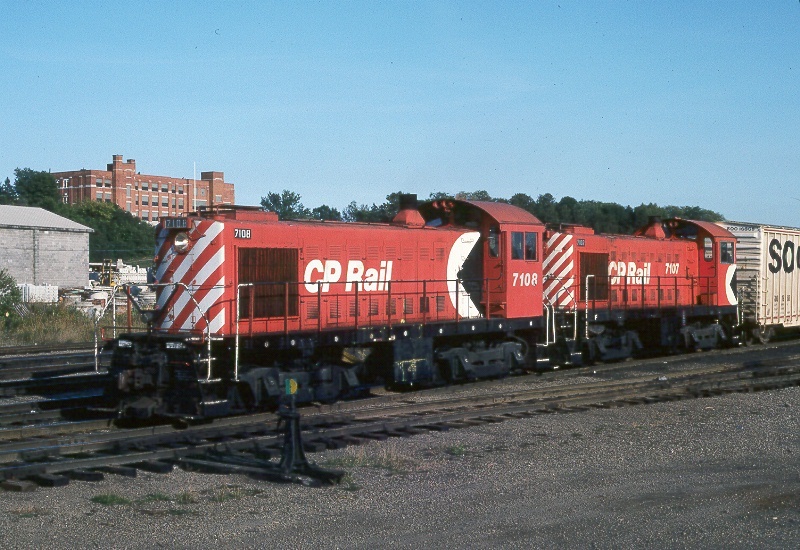 Note that while the units are in numerical order, the paint schemes are somewhat different. 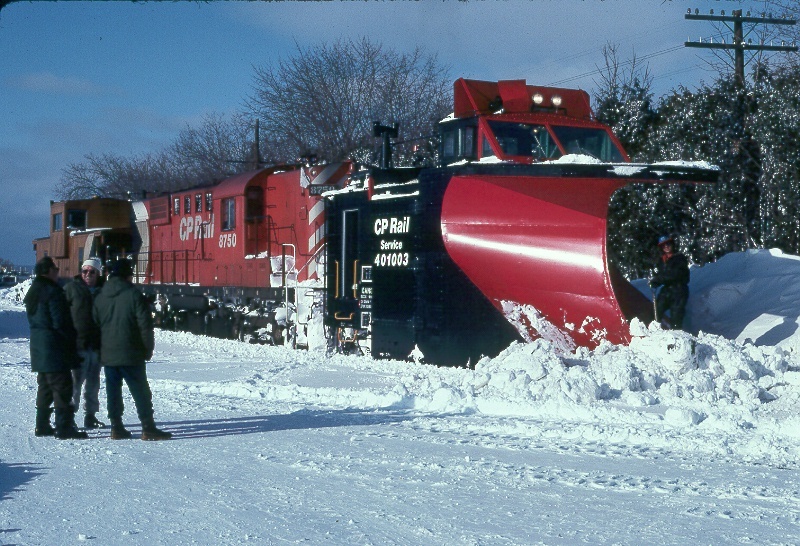 Here is a work plow extra getting ready to head east from the Soo on Jan 12, 1982. "Down the Line" near Echo Bay, Ontario the plow train is making good speed. Jan. 12, 1982. 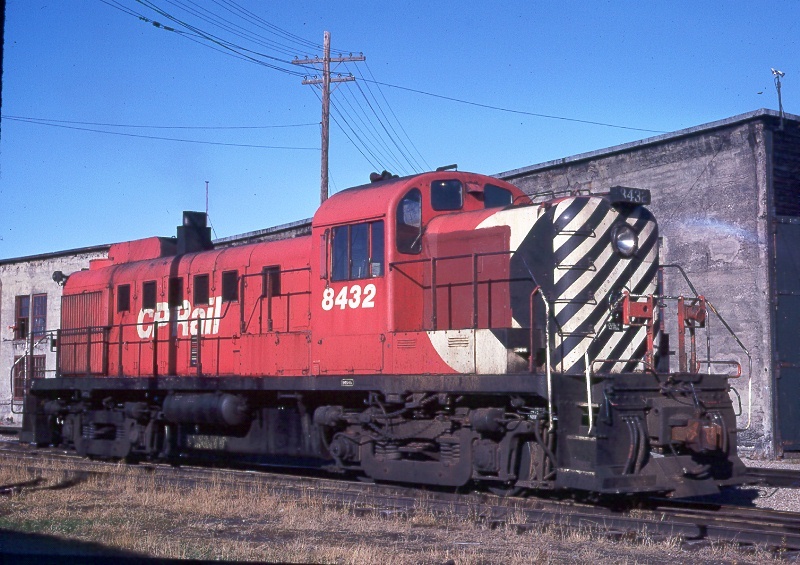 On Aug. 6, 1982 Train 911 brought in a spare yard engine so that the usual one, 8171, could be sent to Sudbury for maintenance work. 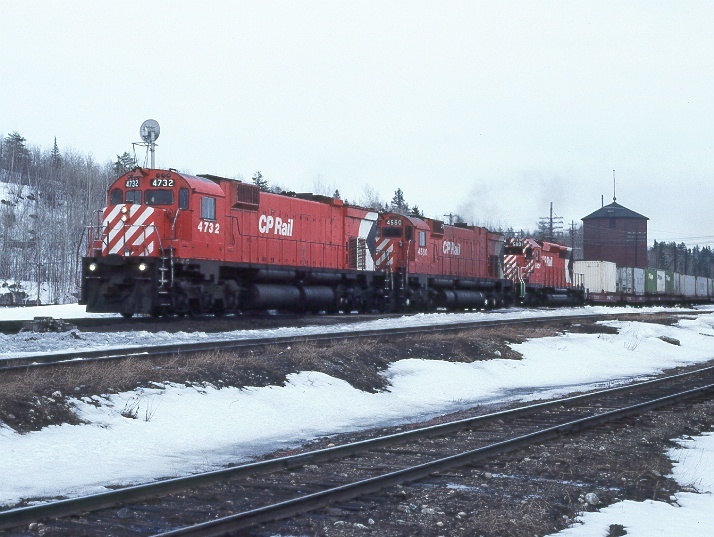 On March 6, 1983 I got this shot of an eastbound train at Franz, Ontario, which is where the ACR crosses the CPR at grade. Even though it was a dark gloomy day (March 6, 1983) I still had to take this shot of the Alco's headed westbound right at the diamond. April 1, 1983 and I was back at Franz for another weekend of film wasting! Here is a westbound just west of the station. This is the Franz station early in the morning of April 2, 1983. This photo was taken from the front porch of Reggie's house (the Franz operator's home). 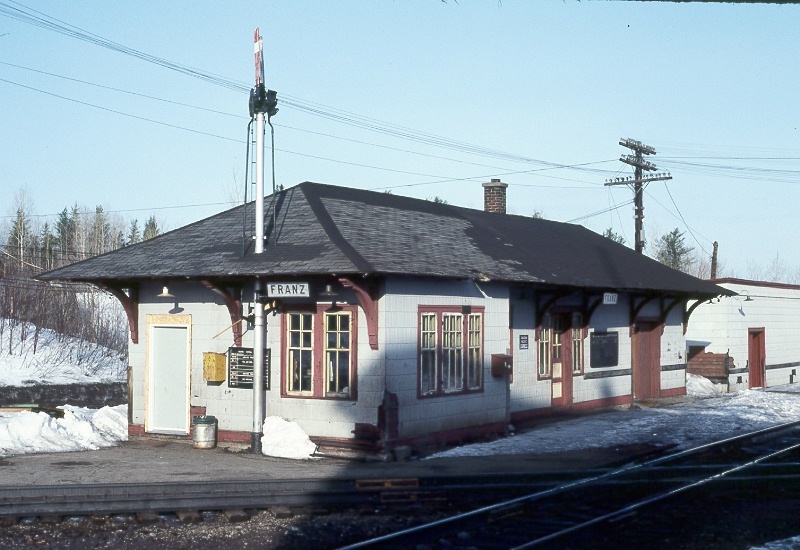 This station was later moved to Dubreuilville, Ontario for use as a town civic centre. 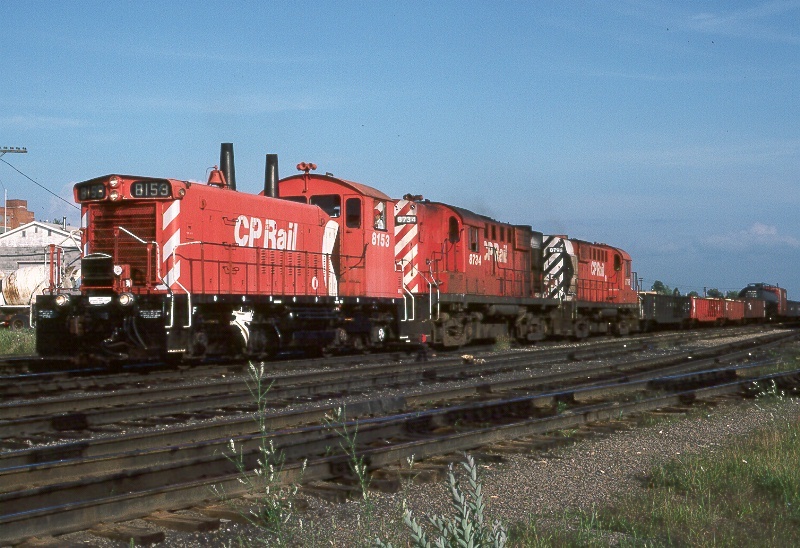 August 26, 1983 saw this hot westbound at Franz, Ontario. 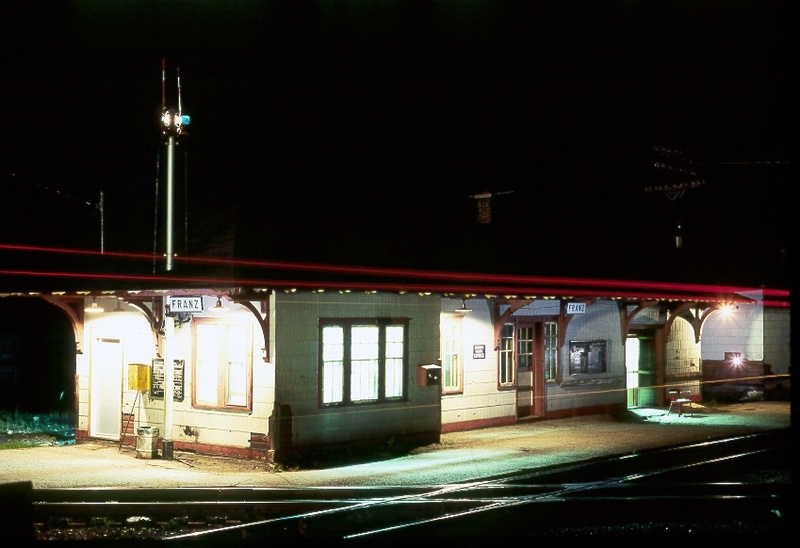 That night (August 26, 1983) I got this time exposure of the station at Franz. The red streaks are from the markers on a van from a westbound train. This photo was also taken from Reggie's front porch. See the daytime photo of the station above. And this was one of the last photos I got at Franz before moving to Arizona. This is an early morning eastbound just crossing the diamond on Oct. 8, 1983. I hope you have enjoyed these older CPR shots! This Web page and all photos on it ©1999 by Ted Ellis. All rights reserved.